See it now through September 30th at Heritage Museum & Gardens in Sandwich MA! My Garden Gate! 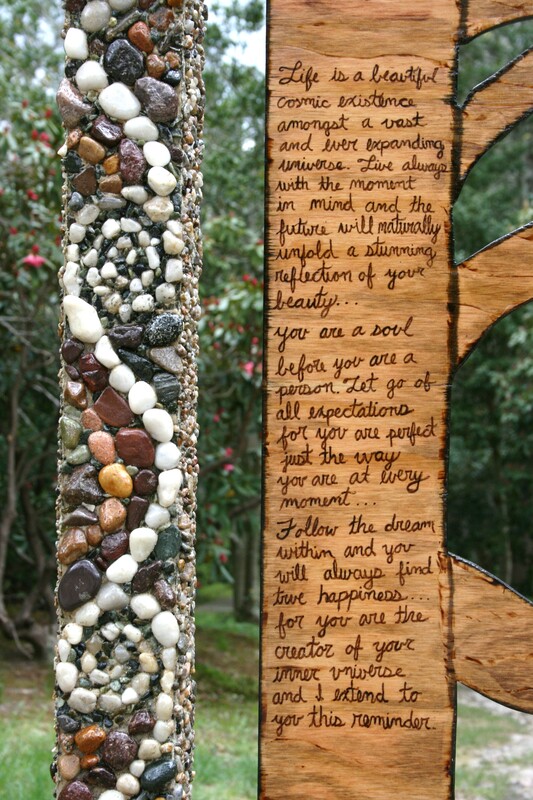 This garden gate is an earthly tribute to the natural world we so depend on for our very existence. 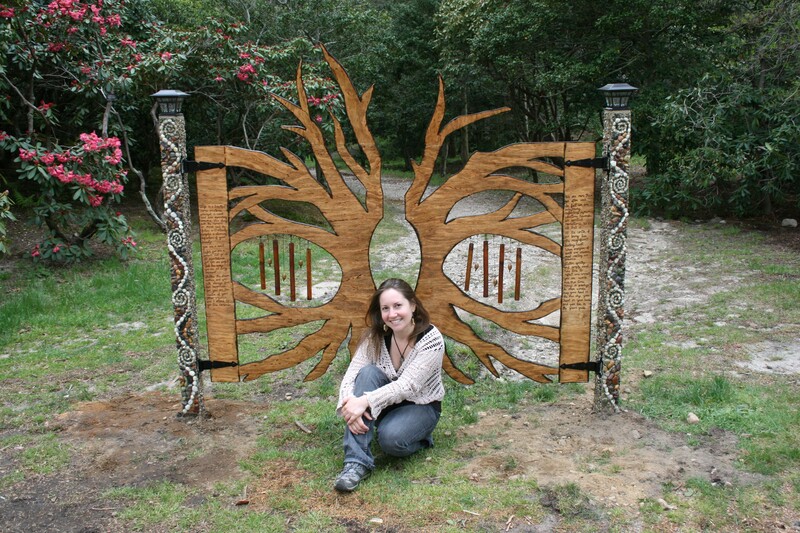 The main image of this gate is a fanciful tree of life. The tree of life throughout cultural history is the embodiment of creation, the interconnectedness of all things, and a balanced existence in all terms. The tree of life reminds us to take time to reflect on our existence in relation to the natural world and to treat it well. We are our environment and depend on it wholeheartedly. 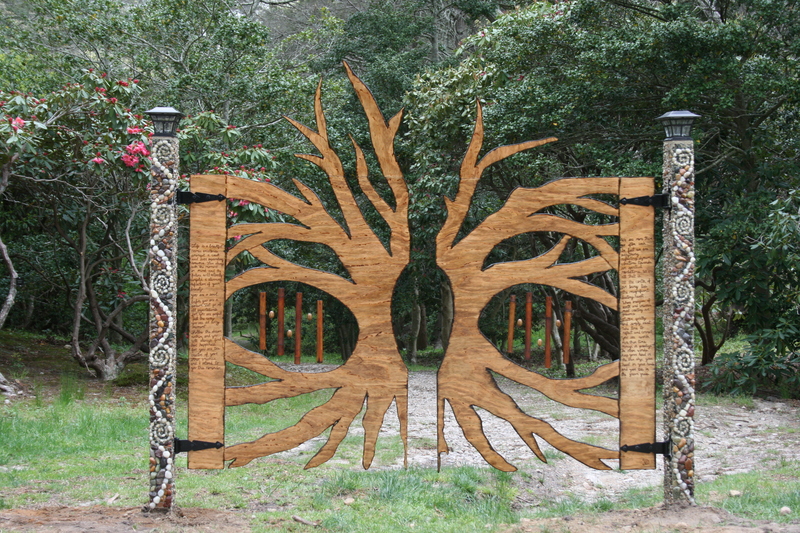 This tree of life opens in the center as a double door, swinging gate. 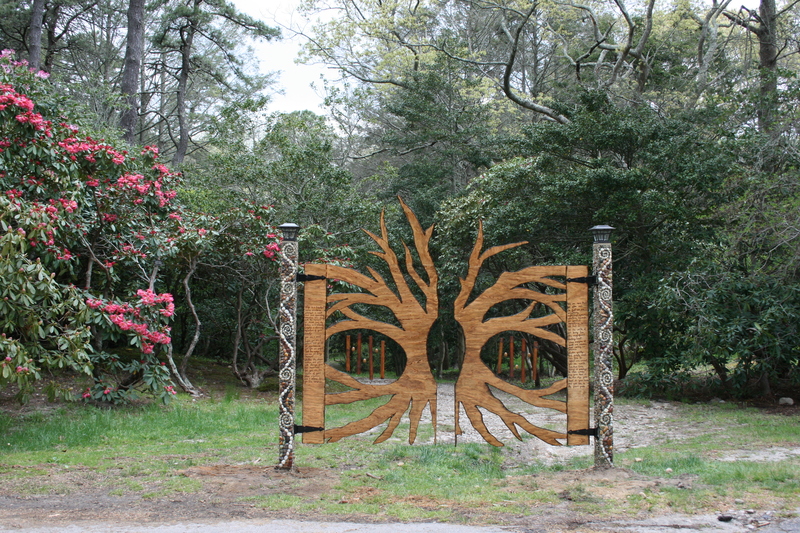 In walking through this gate one is essentially walking through this tree of life, and becoming a physically interactive reflection of it. Paired with the tree of life design, is a spiral motif amongst the mosaiced pillars. Throughout cultural history around the world, the spiral has been a symbol of growth, transition, and change.These are all characteristics of nature and life, we can always count on. 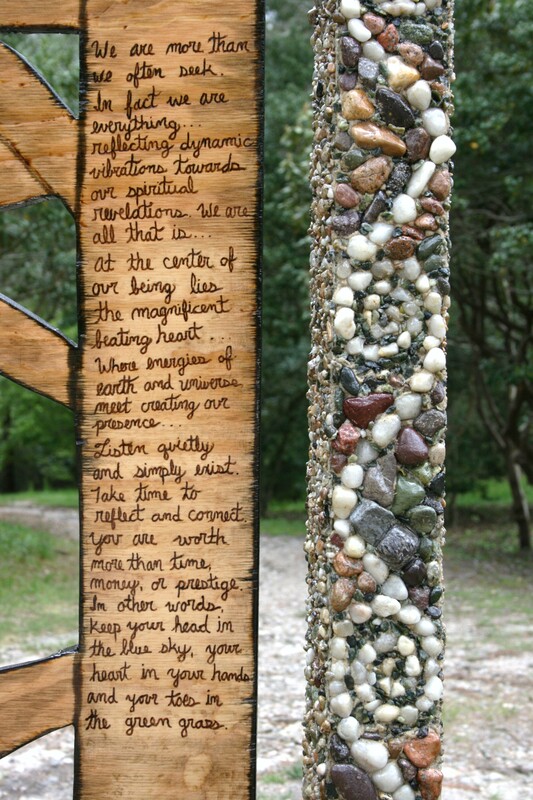 This gate not only embodies symbols of spirituality and nature, but also exhibits all earthly elements in tribute to life itself. 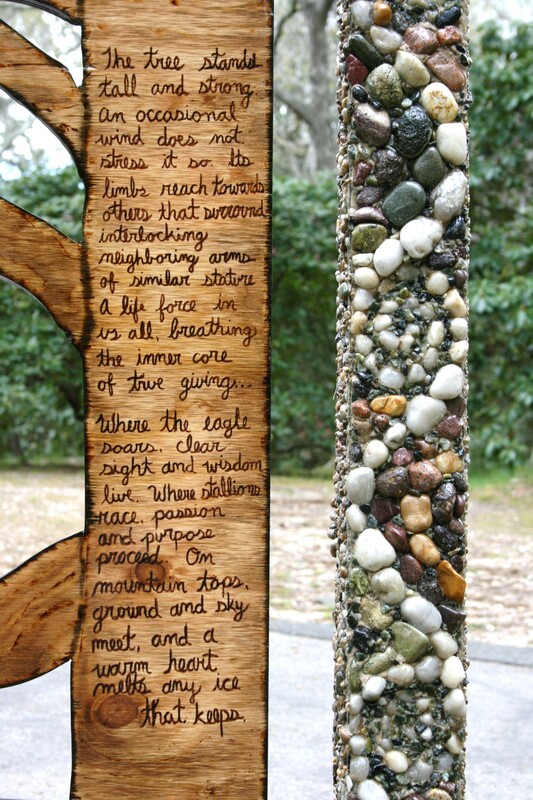 The element of earth is represented by stone mosaic and tree design of the swinging gate. The element of water is represented by stones collected from Sandy Neck Beach (Sandwich, MA), where they spent millions of years at sea. 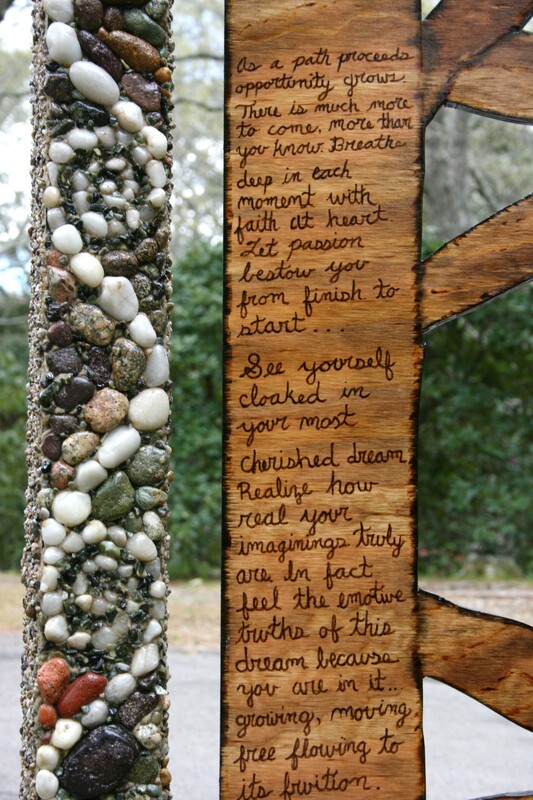 The element of wind can be heard in the peaceful sound of chimes hanging within the gate. Lastly, the element of fire holds its essence in wood burned designs amongst the tree, and also in solar lights which have captured the sun’s power, exhibiting a night time glow. Busy with our societal lives, we often forget how dependent we are on our Earth and all that it naturally does for us. It is outstanding and majestic. Without our efforts the earth rotates within the universe, around a sun at just the right distance,in order to have just the right climate for our very existence. The ocean evaporates into cloud cover to produce rain, providing us with essential nutrients such as plants which produce our oxygen and food. Let us not forget the insects that aid in pollination. Without them, plants would not bear fruit and produce seed. These interconnected cycles of existence are spiritually significant in my daily life. I am an artist, a teacher, a Reiki Practitioner, and live each day in appreciation of all these naturally occurring wonders. It is through my artwork, healing practice and teaching, that I am able to share this earthly and spiritual appreciation with others. Ultimately, I hope to help others find their reflective self within our busy world. Take a moment to breathe, for you are magnificent and part of the whole. Where Can You View & Purchase D'Agostino's Work?